I hope this message finds you enjoying this holiday time, and that you are able to find some respite along with the excitement and bustle of the season. Last month I wrote a little about yoga as a path to peace of mind, an effort to get in touch with our true selves and a greater whole. The holidays offer a unique opportunity to explore this, because we are outside some of the patterns that may govern other parts of the year. So what about this "cessation of the movements of consciousness" that is yoga? The yoga sutras tell us that we can get to this state of peace by various paths, the most prominent being shopping. Just kidding, wanted to see if you had read this far :-). Actually, Patanjali writes in Sutra I.12 that "Practice and detachment are the means to still the movements of consciousness." Practice is our dedicated effort to pursue an inward journey. This is more than just doing yoga poses - it is the full experience of each asana, as if we are doing the asana for the first time, yet still informed by previous learning. Detachment is freedom from desires. With respect to asana, this could mean not being motivated by appearance-related goals, such as pushing to touch the floor when your back is already very rounded. 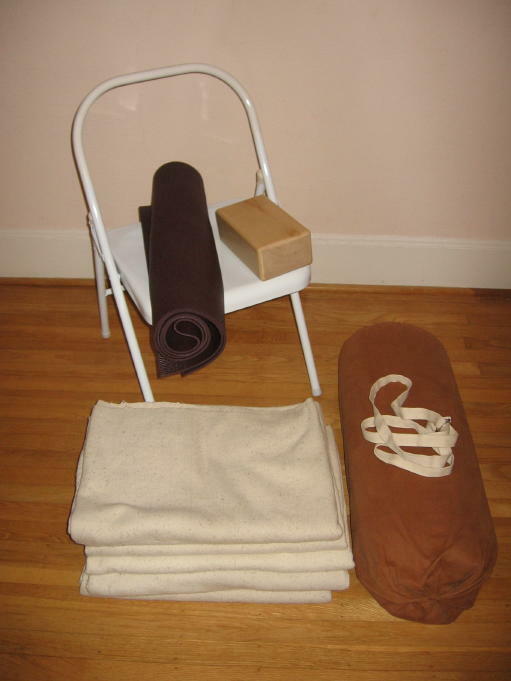 What about practicing yoga at home? Home practice can range from a dedicated hour or more daily to an occasional downward dog. In pursuing a home practice, it is important to be both forgiving (an aspect of santosa, or contentment) as well as to be stern with yourself (an aspect of tapas, or burning zeal). If you feel very pressed for time but would still like to practice some yoga, it can work to carve out just 10 minutes in the morning for a few poses. What these poses might be depends on you. For example, in 10 minutes, you could do dog pose (1 min), a couple of standing poses (4 min), and a restorative asana, such as savasana, lying with your legs up the wall, or supta baddha konasana (knees bent with soles of feet together, lying back) (5 min). Or if you only have five minutes, you could just do downward dog once or twice and then savasana. The idea is to begin practicing with poses that you understand, can feel the effects of, and are not intimidating. Once you do a pose or two, you might find that you want to do more, and time magically appears. Even for those who have established home practices, these principles still apply. Getting started with a first pose is often the biggest step. So pick something that you really feel like doing to get started, something you sense your body might need to gain energy or to calm down. Maybe that single pose will be your practice, and maybe it will lead to more. The photo below shows some props that might come in handy. You may have some or all of them already. The most important ones are the floor and the wall, which you most likely have :-). Once you use a prop for a pose in class, you can then decide if it is worth having that prop for the poses you might do at home. It is comforting during this solstice time that another path to a tranquil state of mind is articulated in Sutra I.36 as "contemplating a luminous, sorrowless, effulgent light". B.K.S. Iyengar points to the "innermost core of the heart" as the source of this light. But the festive lights of this season, regardless of your holiday of choice, if we take the time to let them in, surely help point us in the right direction. As always, I would love to hear your thoughts and reactions to anything in this message.